I've written about things I've eaten, places I've been, and things I have bought. 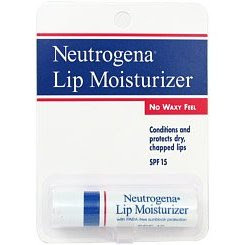 Recently, when I was stocking up on this - Neutrogena's Lip Moisturizer, I realised I've been using this staple in my make-up kit for more than 10 years! The realisation jolted me, because in this day and age, in our use and throw generation, where trends come and go, 10 years is a long time. Sure, I've tried a ton of other brands, mostly because I've received all sorts as gifts, and sometimes because get tempted to try something new. But the end result is always the same, nothing beats this product. Some of you know I've really allergic lips, that's why I hardly ever wear lipstick. This not only moisturises my lips, but it also leaves a lovely sheen. Because my lips are rather dark-coloured, this is all I need for most days. In fact, (dare I say it), sometimes that's all I use even for formal dos. Especially when lipstick wearing days have piled up consecutively and I know that pushing it any further will result in a lip rash (eek). So yeah, here's a great product I'd recommend. I hope it never goes out of production! i use this as well! in fact im stocking it up now as guardian, or is it watson, is selling them for $1.95 now! jacinta: Yes do :) Very reasonably priced too! eleh: Oooh, I didn't know that! I just bought 3 though, before the sale I think! CDR: Ahhhhhhh another similarity! hahahah :) Yes I always use it under lipsticks too! ame: Is that the one you have to squeeze out of a tube? A bit oily leh. I use this too! Tho now I'm trying out Kiehls. Realised its also about 10 years...I rem using it in JC..whipping it out during physics prac. Hahah.